When it comes to constructing a menu for a special event, business dinner, or restaurant offerings, there are several things to keep in mind. Firstly, giving your business a visual identity is important for communicating your product to your customers. Having a visual structure, using the right colors, and incorporating various design elements will help to optimize the readability of food and other menu offerings. Ensuring that a hierarchy of text is included for largest headings, sub headings, item listing, and descriptions are integral for capture attention from your readers. The following listing includes a half dozen of available menu templates available on the web for designing your personal menu. This will help to save you time with designing your menu from scratch while making it easier to product minor modifications and customizations to your end product. Available on Behance, the following restaurant menu template is both cleanly designed and professional for capturing your full offerings. The included page layouts were created to be high quality and make it easier to edit text and images by having them separated among multiple layers for your template. This templates includes to pages, created at a standard US letter size and 3mm bleed line. It is print ready for CMYK @ 300DPI. Change colors with simple modifications and edit character and paragraph styles. 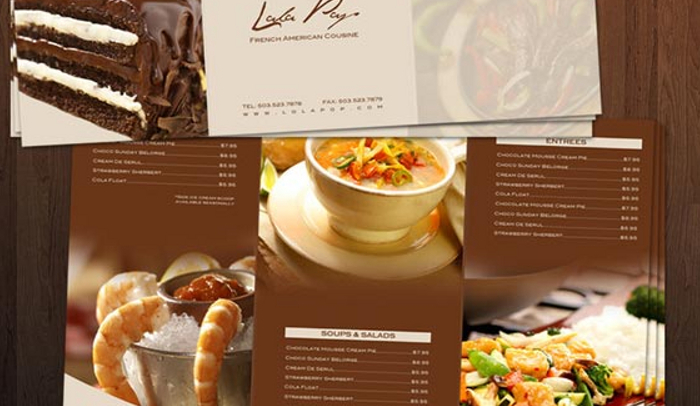 This menu template captures the cover name and brand for the restaurant and inner covers with proper headings, pricing columns, and dish description for your menu. Available for InDesign CS4 and color variation changes can be made to this template design. 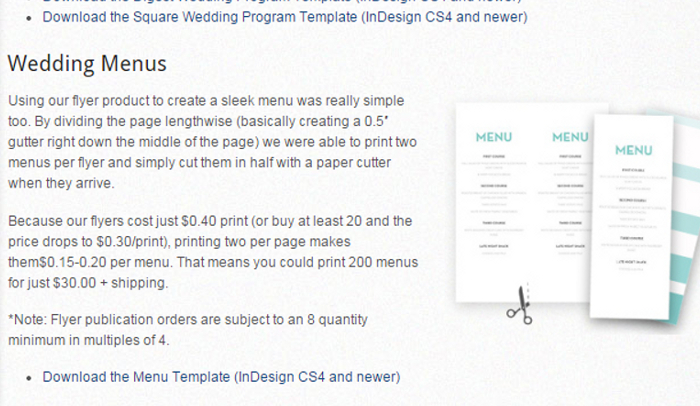 If you are looking for a menu template for a special event such as a wedding, this template is perfect for you. 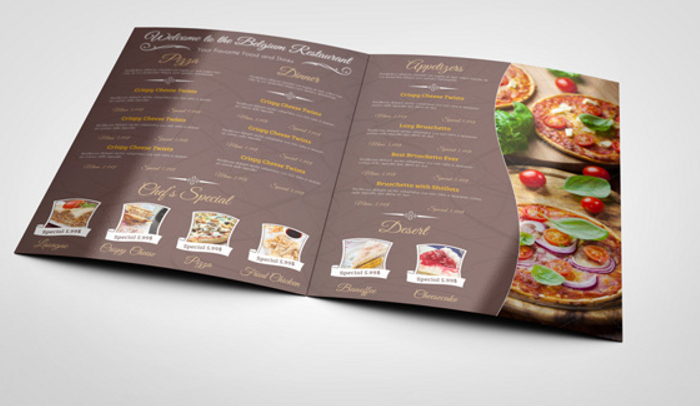 Make available in two template designs, you can have a menu flyer posted or folded table version for your guest. This menu style helps to capture your main dish offerings and course schedule for your big event. 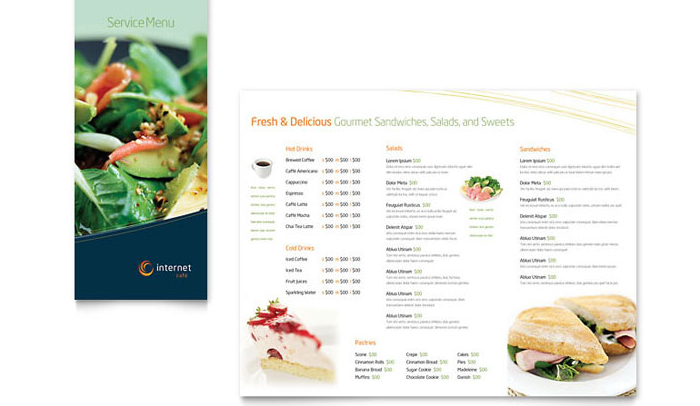 A tri-fold style menu template is available at Stock Layout. Perfect for small service menus that service a basic selection of dishes for breakfast or lunch, these templates allow you to incorporate a few images of some of your specialties while adding in other categories for drinks, sides, desserts, and main dish offerings. 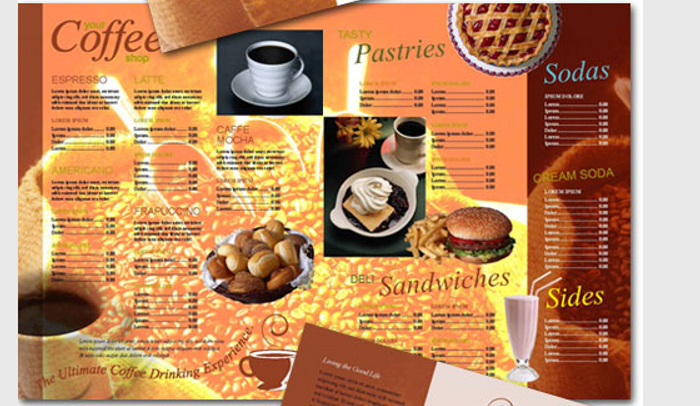 Visit Design Sparkle to locate an estimated 40 restaurant menu templates to use with a variety of designs. Ranging from menu flyers, bifolds, and tri fold designs, many of these high quality templates allow you to capture your brand and logo, images of some of your best dishes, and specific heading types to capture entrees, sides, drinks, desserts, and more. 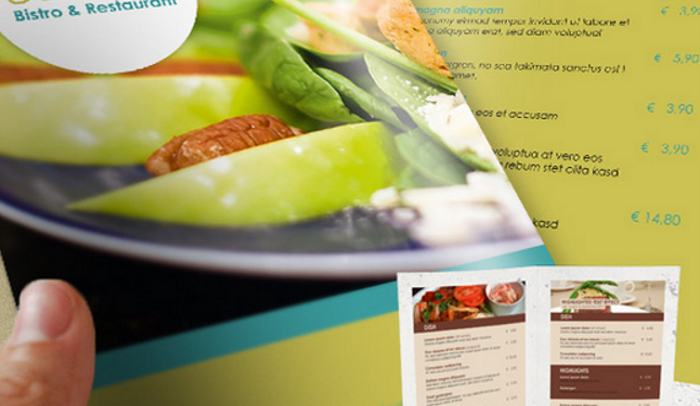 This simple folded menu template has a front, back, and inside spread to use for your menu. Designed for at a US standard letter size, full color and more than 3 panels are available to customize as desired.